Memphis, Tennessee and Woodland, Washington, August 28, 2010 - ITI (Industrial Training International, Inc.), a 25-year, worldwide leader in crane and rigging training and consulting has opened.. 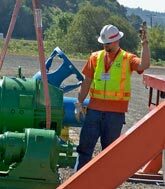 When considering what to look for during a mobile crane inspection, site supervision should ensure checklists and inspection forms are in use which can help personnel perform their work. If an.. The ACRP ( Association of Crane & Rigging Professionals) met in Shreveport, LA during May 11-13, 2010. A series of in-depth presentations were made on the most current updates to the ASME..
As you know in ASME B30.9 SLINGS and other industry documents that highlight sling capacities, there are stated design factors. Also in B30.26 RIGGING HARDWARE which covers shackles, swivel hoist..